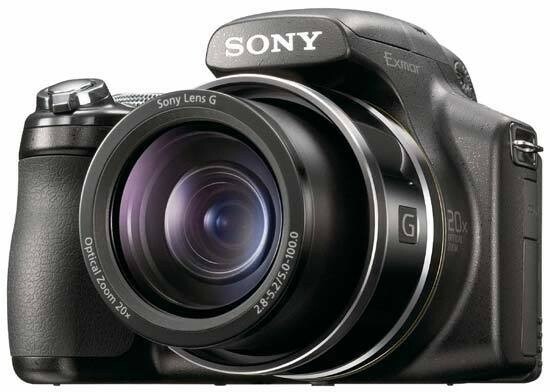 The Sony Cyber-shot DSC-HX1 is an innovative super-zoom compact camera, offering a 20x optical zoom range (28-560mm) and a G branded lens that was originally developed for the Sony Alpha DSLR family. The 9 megapixel Sony HX1 features a new Sony-developed Exmor CMOS sensor which promises to deliver outstanding images with reduced noise, and the powerful BIONZ image processor supports full-resolution shooting at a remarkable 10 frames per second. Other standout highlights include 1080/30p HD movies, a 3.0 inch tilt-angle LCD screen, and a new Sweep Panorama mode which captures extra-wide landscapes easily and quickly. Retailing for around £480 / $500, we find out if the Sony Cyber-shot DSC-HX1 can live up to its promise. With its numerous new and intriguing features, the Sony Cyber-shot DSC-HX1 was one of the surprise announcements of 2009. If we consider it a successor to the H50 of yesteryear, then we can argue that Sony is showing a rare example of megapixel restraint here; as the new model has the exact same resolution as its immediate forebear. Instead of upping the pixel count, Sony decided to endow the HX1 with a new lens, faster electronics and some truly unique features - and this was more than enough for the camera to make the headlines. No wonder we were eager to get our hands on a production model for a review! A camera with a 20x zoom will never be shirt pocketable, but the Sony HX1 is actually quite compact and lightweight; definitely smaller and lighter than most DSLRs with a typical 3x kit zoom. Interestingly, this does not really affect handling in a negative way. While people with large hands will find that the little finger of their right hand has a more comfortable place underneath the camera than on the right-hand grip; most users will find the grip quite nice actually. It is ergonomically sculpted and the textured finish provides great purchase for your fingers. Arguably the most remarkable part of the Sony Cyber-shot DSC-HX1 is the lens. As mentioned earlier, this is a 20x zoom that spans focal lengths ranging from 5mm to 100mm (28-560mm in old money). While there are a couple of competitors sporting an even more impressive range, this is still nothing to sneeze at - and Sony are even offering a 1.7x add-on teleconverter as an optional accessory; for those who would like to push the telephoto end to an almost incredible 952mm equivalent. The maximum aperture is a fast f/2.8 at the wide end and a more modest, yet perfectly acceptable f/5.2 at the other extreme of the zoom range. The zoom is of course stepped, but feels surprisingly smooth in action. It is quite fast too, especially for the huge focal range it spans. The lens proudly bears the G designation, originally introduced by Minolta to distinguish their most prestigious lenses from the rest of the pack. Fortunately, it has lived up to our expectations - you can read more about this in the Image Quality section. Putting such a huge zoom on a camera that is intended chiefly for hand-held use would of course be nearly pointless without image stabilisation - thankfully, the feature is on board, under the brand name Optical SteadyShot. From the main shooting menu, you can specify if you want it to be always on or to kick in only when you are actually taking a picture. In the former case, you get a stabilised live image that helps with your composition, while in the latter, you theoretically get more effective stabilisation and definitely less battery drain. The Optical SteadyShot feature can also be switched off completely, for tripod work. Above the lens is a bulge that resembles a prism hump, although of course there is no pentaprism to be found on the HX1. You can frame your shots using either the rear screen or the electronic viewfinder (EVF). Switching between the two is done by way of a button to the left of the mock prism housing, viewed from the back. I would have preferred Sony to place eye proximity sensors around the viewfinder eyepiece, so that the switch would occur automatically when you lift the camera to your eye, but you can get used to the button too. The EVF itself is crisp and reasonably fluid, but very small. One gets the feeling that this was one of the areas where Sony cut corners in order to keep the price within reasonable limits. As far as the rear LCD goes, it is a three-inch, 230,400-dot affair that tilts 90 degrees both up- and downward. This makes it more flexible than the one on the A330/A380 DSLRs, which does not tilt that much down, but it's still not quite as great as the vari-angle design of some competitors. Outdoors visibility is quite good; perhaps not the best we have seen, but definitely a lot better than many other screens. Right above the thumb wheel is the shooting mode dial. At first sight, it looks absolutely conventional, but a closer look reveals a few unique icons. However, let's start with the more traditional stuff. Experienced photographers will be delighted to hear that the Sony HX1 has all the typical P, A, S and M modes, with the P mode even featuring a Program AE Shift function. Exposure compensation is available in the P, S and A modes via the thumb wheel, and works particularly well in tandem with the optional live histogram you can have superimposed over the live image, irrespective of whether you are using the rear LCD or the EVF. Even your picky reviewer finds it hard to criticise anything here, except for the oddity that the top shutter speed is 1/4000 second in S mode, but only 1/2000 in M.
Those who don't like to fiddle with shutter speed and aperture but would still like to communicate to the camera what kind of subject they intend to photograph can choose from 10 different scene modes by turning the mode dial to the SCN position and pressing the MENU button. Alternatively you can trust the scene selection to the camera by picking the intelligent Auto mode. 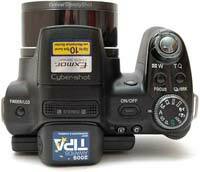 There is also an Easy mode, best used when handing the camera over to someone who isn't familiar with it at all - for in this shooting mode, they can't alter any settings except for the flash mode and the self timer. And now for the Sony Cyber-shot DSC-HX1's novelties. One of these is the Sweep Panorama mode, which lets you capture a panoramic image very easily, without the use of a tripod. All you need to decide is whether you would like to start from left or right, top or bottom. Then press and hold down the shutter release while doing a sweep with the camera in hand. Exposure compensation is available before you start the sweep, but the exposure is of course fixed once you depress the shutter button. After you are done with the sweeping, the camera does all the processing required, and presents you with a finished panoramic image. The catch is that it's of relatively low resolution: the shorter side is invariably 1080 pixels, whereas the longer side is 4912 pixels for a 'standard' panorama, and 7152 pixels for a 'wide' one. Note also that if you do the sweeping too slowly, or you let go of the shutter release button too early, the panorama will be truncated. There are two more shooting modes that are new: Hand-held Twilight and Anti Motion Blur. In both of these modes, the camera takes six shots in a rapid sequence, typically at a high sensitivity setting and a (relatively) fast shutter speed, and then combines them into a single image that has somewhat less noise than a single shot taken at the same ISO and exposure settings. In my experience, the difference between the two modes is that in Anti Motion Blur mode, the camera is more willing to pick a really high ISO setting like ISO 1600 to maintain a fast shutter speed, whereas in Hand-held Twilight mode, it will only go as high as absolutely necessary to avoid camera shake at the chosen focal length. If light levels are truly low, however, the HX1 will pick a high ISO speed even in this mode. Movie recording is also accessed via the shooting mode dial. The Sony HX1 can capture standard-definition VGA, 1280x720-pixel HD and 1440x1080-pixel HD movies, the last of which comes in two flavours, Standard and Fine, which differ in their bit rates. The frame rate is 30fps in all video modes. Sound is recorded via the stereo microphone sitting on the top of the camera, behind the flash. Note that there is no wind filter. A big plus is that you can use the optical zoom while filming. Like a number of other Sony compacts, the Sony Cyber-shot DSC-HX1 reproduces the mode dial on the LCD/EVF while changing modes. This proved to be a great help when shooting in the dark. In front of the mode dial, there are two buttons for focus mode and drive mode selection. For a digicam, the Sony HX1 has a surprisingly comprehensive set of focus modes. Multi AF is best when shooting a subject against a homogeneous background, such as a bird or an airplane in the sky. Center AF is self-explanatory, while Flexible Spot AF allows you to position the active autofocus point almost anywhere in the frame. Ironically, this is much more straightforward to accomplish on the HX1 than on the Sony A330 DSLR we recently reviewed. Just push the button in the middle of the four-way pad once, and then use the arrow buttons to move the AF point around in the frame. On top of the autofocus options, there is semi manual and full manual focus available too. In both of these modes, you are presented with a superimposed distance scale, and can use the Left and Right buttons to pick a subject distance. The centre of the frame is magnified in both of these modes to aid you with focusing. The difference between the two modes is that in semi manual mode, you set an approximate distance, and the AF system then tries to focus on something that's roughly that far away from the camera. Full manual mode is what it says on the tin: focus is set to the distance you specify. The HX1's approach is less natural than turning a focus ring, but it works. I'd prefer to see more distance markings though. Pressing the drive mode button brings up a number of options, including single shot, high-, mid- and low-speed continuous and exposure bracketing. Out of these, the high-speed continuous mode is the most remarkable. The camera takes up to 10 full-resolution photos at a frankly astounding 10 frames per second. I had the opportunity to try this feature out at an air show, and the results were spectacular indeed. The fly in the ointment is that once the burst is completed, it takes over fifteen seconds for the camera to clear the buffer, and during this time you cannot take another picture. In the other two continuous shooting modes, the Sony HX1 also takes up to 10 pictures, but at a speed of 5 or 2 frames per second. In bracketing mode, the camera takes 3 shots with different exposures in rapid succession. There is a customisable button marked with the letter C, which activates the now familiar Smile Shutter by default, but can be reprogrammed to provide quick access to the metering modes or white balance options instead. This is nice, but I would love to see a couple more options, like SteadyShot and DRO settings, both of which are only available via the main shooting menu. Somewhat surprisingly for a camera in this class, the Sony Cyber-shot DSC-HX1 does not feature a hot-shoe, so the only way to sync up an external flash with it is to optically slave it to the built-in unit. Speaking of which, it lacks a mechanical button to simply pop it up. 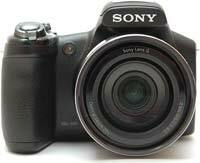 As with the Sony A330 DSLR, you need to go into the Flash menu by way of the Right arrow key, choose the required flash mode and exit the Flash menu. The flash will only pop up when you (half-)press the shutter release. If you don't want to use it any more, it is not enough to push it back - you need to re-enter the Flash menu and select the Flash Off option. Otherwise it will pop up again the next time you hit the shutter button. Once an image is captured, the Sony Cyber-shot DSC-HX1 can display it immediately - but you can't erase it, and the quality is not that great either. In order to properly check focus and / or delete the image, you must enter playback mode via its dedicated button. The image is much crisper and more detailed than in instant postview. As in record mode, you can choose from a variety of display options via the DISP button, including image only, shooting info with or without histogram, at two different brightness levels. As with a number of other Sony compacts we have tested, the post-capture histogram is not always displayed, even when you are in the right display mode. Very often a crossed-out circle will appear where the histogram should be. One thing I found incomprehensible was that the lens retracts way too soon, just 15 seconds after entering playback mode. This means that if you spend more than 15 seconds reviewing the image you've shot, you will have to reset the zoom to its previous position manually when you re-enter record mode. The images are captured on Memory Stick Duo or Memory Stick PRO Duo cards (there is a 11MB internal memory too, but it only holds two full-res images, so it's not much to fall back on). The HX1 seems to prefer Sony branded cards - it will take third-party memory cards too, but grudgingly. 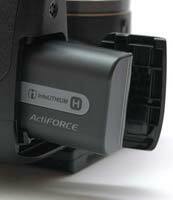 With a Lexar branded Memory Stick PRO Duo card inserted, the HX1, like the H20 we reviewed earlier, would take every opportunity to display the warning, 'This Memory Stick may not record or play', despite the fact that it worked perfectly. 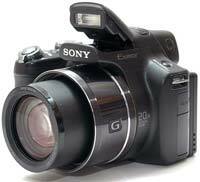 The Sony Cyber-shot DSC-HX1 runs on a proprietary Lithium ion battery that bears the InfoLITHIUM logo. What this means is the camera can display how much recording time is left in minutes, which I found very handy and much more informative than the usual battery indicator. The connectors include a DC IN socket and a proprietary port that also serves as an HDMI interface (you'll need the supplied HDMI adapter and a separately sold HDMI cable though). On the bottom of the camera, there is a standard tripod socket, which is made of metal but is not aligned with the lens' optical axis. It is too close to the battery/card compartment door, so changing batteries or memory cards is not possible while the camera is on a tripod. In use, the Sony Cyber-shot DSC-HX1 proved to be a fun, flexible and generally snappy camera. Shot-to-shot times averaged barely more than a second in single shot mode, and auto-focus was generally zippy too for this class of camera. However, when dealing with really fast-moving subjects, especially in high-speed continuous mode, it was still better to prefocus, anticipate the action and rely on depth of field than to hope that the AF system would be up to the task. This rounds off our evaluation of the Sony Cyber-shot DSC-HX1's handling, features and performance; now let us see how it fared in the image quality department!